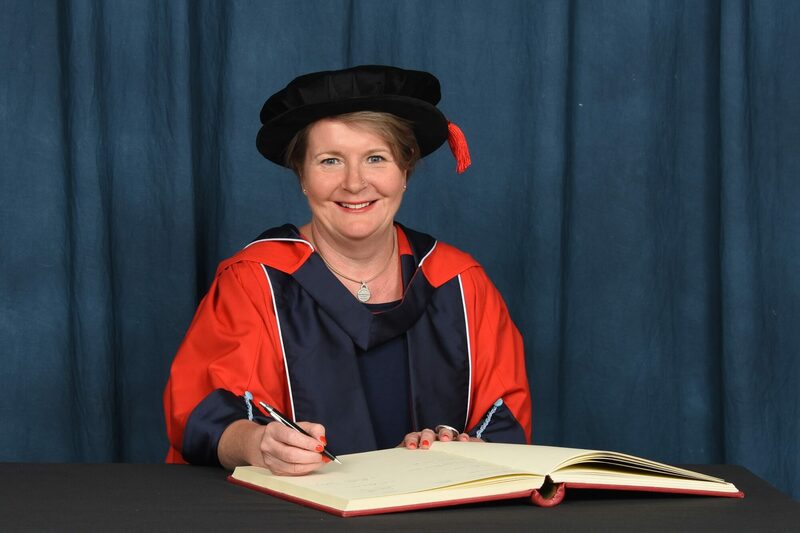 Chancellor, Vice-Chancellor, honoured guests and graduands, it gives me great pleasure to be presenting today Kathryn Stone OBE, for the award of Honorary Doctor of Laws. Born in Derby and raised in Belper, Kathryn has spent all 40 years of her career in public service. She recently became the Parliamentary Commissioner for Standards, an independent officer of the House of Commons overseeing the code of conduct and rules for MPs. Kathryn went to London to study a degree in Sociology, spending many weekends and holidays in children’s homes, day centres, old people’s homes and secure units, listening, learning and developing an understanding of the people she met. She graduated in 1985 and followed up with a Masters in Women’s Studies from Loughborough University. Kathryn began her career as a houseparent for children with special needs. She then became a qualified child protection social worker and mental health practitioner which led her into regulatory roles as a care services inspector. In 2001 she became the chief executive of national charity Voice UK. She spent 11 years in this role representing the rights of people with learning disabilities who had been victims of abuse and crime. Kathryn’s valuable work was recognised in 2007 when she was awarded an OBE for her services to people with learning disabilities. Returning to England in 2014, she became a Commissioner for the Independent Police Complaints Commission, with responsibility for seven police forces in the Midlands and the North including Greater Manchester police, which is the second largest force in the UK. Over the years she worked on a range of issues, including hate crime against disabled people. In 2016, Kathryn took up the role of Chief Legal Ombudsman of England and Wales. In this role she scrutinised complaints submitted to the Office for Legal Complaints and assessed how they were handled. She introduced a three-year plan to improve the process to make it easier for consumers to seek support about poor service from the legal industry and get the advice they needed. Last year Kathryn was recruited as Parliamentary Commissioner for Standards following a rigorous selection process which began with 81 candidates. She is the sixth commissioner since the post was created in 1995. She has responsibility for overseeing the Register of Members’ Financial Interests and the Code of Conduct for MPs. She also provides confidential advice to individual MPs where the need arises. Chancellor, in recognition of her outstanding contribution to public service and 40-year career as a public servant, we are delighted to award Kathryn Stone the honorary degree of Doctor of Laws.